I've spent a good part of the last day at the first annual Bookmark Collector's Virtual Convention BMCVC, where one of the presenters was Jen Funk Weber, who has created a program called Needle and ThREAD, Stitching for Literacy. 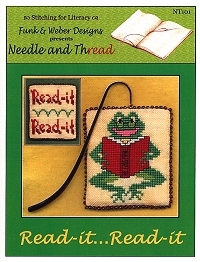 From her website: "In an effort to promote both literacy and needlework, Funk & Weber Designs is designing bookmarks. A minimum of 10% of profits from sales of Needle and Thread: Stitching for Literacy bookmark patterns will be donated to libraries, schools, and/or literacy programs." Sounds like a wonderful program to be shared in libraries. Check out her Bookmark Challenge Kit. Things are heating up for Amazon.com on the sales tax front again. The California Senate just passed a bill that would require online retailers like Amazon to collect sales tax on web purchases. According to reports, the measure was part of a $5 billion budget package making its way through the California legislature. Virginia, Colorado and Illinois are also considering sales tax bills targeting online retailers. Amazon — which only collects sales tax in a handful of states, giving it an advantage over brick-and-mortar retailers — fought hard against a similar wave of bills last year, and managed to stomp out most of them. But for cash-strapped states, desperately seeking new sources of revenue, the "Amazon tax" continues to be a powerful draw. California lawmakers introduced a similar bill last year, but Gov. Arnold Schwarzenegger threatened to veto it, and the matter was dropped. But with California in the midst of a budgetary meltdown, the idea has popped up again. According to reports, the "Amazon tax" bill is expected to generate $107 million in tax revenue annually for California. The measure has yet to be signed by the Governor, but with California in fiscal crisis, he may just sign the bill this time. 1.Raise your voice. Join the Facebook group "Librarians for Fair Access to Content." Tweet. E-mail us at [email protected]. Call publishers and information providers and share your library's mission; tell them why these licensing practices are bad for libraries. 2.Pass this message along to other librarians and those who make decisions regarding your funding levels. Get others involved. There's strength in numbers. 3.Don't reward the behavior. Work with information providers who support your mission and understand your needs. As the cost of licensing content increases artificially, prices will go up. If you worry about information costs going up, we ask you to take a stand. "So why are these librarians taking it? Why are they being quiet? I don’t have an answer for you – and so I’m hoping someone out there can answer this for me. If you signed a contract for one product and then are told you have to use another – do you just say okay? or do you move on or demand the product you originally wanted." "I've been having unkind words about LibLime percolating in my head for a week which I've been not posting here, because I try not to be an unkind-words sort of person. But I no longer feel restraint about that." OCLC and the Associated Press — Two Sides of the Same Information Provider Coin? * both have prominent members experimenting with new forms of content delivery and use. Read more about OCLC and the Associated Press — Two Sides of the Same Information Provider Coin? Over at American Libraries Sean Fitzpatrick writes when Stephen Abram did weigh in on Open Source, his harsh criticism created quite a dust-up on Twitter and the blogosphere. But Abram’s white paper may have done more to legitimize the role of open source software (OSS) in libraries than challenge it; if nothing else, Abram’s marketing piece revealed that open source ILSs are a threat to the vendor-based market. David Lee King pointed out A Post On Wikileaks about SirsiDynix: "This document was released only to a select number of existing customers of the company SirsiDynix, a proprietary library automation software vendor. According to our source it has not been released more broadly specifically because of the misinformation about open source software and possible libel per se against certain competitors contained therein." [Update]: See Also It's About a Respectful Discussion for a discussion from the author. He's also posted a link to the "restricted" paper. Last week, Wal-Mart cut the price of some popular new books to just $10, a slice of over 60%. Not willing to be out-done on home turf, Amazon matched them. Wal-Mart went down to $9. Amazon went to $8.99. Target jumped in tardily at $8.99. Then Sears jaunted into the battle and dropped some serious knowledge: books for free. How? Buy any one of those deep-discounted books at Target, Wal-Mart, or Amazon, and send Sears the receipt and they'll give you a credit of $9 towards anything you buy from Sears online. Sears says this is part of some campaign called "Keep America Reading" which would be more appropriately called "Keep America Buying Books". And buy books they'll do, if the $10 price point sticks past the holiday rush.